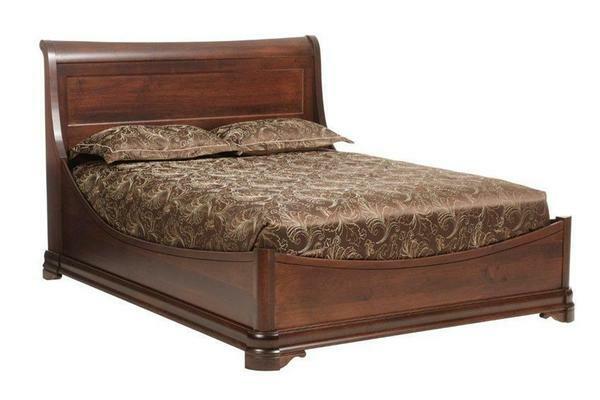 The Amish Versailles Euro bed is the perfect example of elegantly handcrafted Amish Hardwood Furniture. The graceful curves, and beautiful finishes are sure to become a welcomed sight at the end of your long work day. Made in the USA from the finest, hand-selected woods, the Euro Bed is constructed and finished with an heirloom quality that is sure to be a family favorite for decades to come! Available in an array of sizes, from Twin in California King, you can be sure that you'll find the right Versailles Bed to fit your space. Pick your favorite hardwood and finish combination for the perfect compliment to your unique bedroom decor. Call one of our furniture aficionados today to start your order or request wood stain samples to match your existing bedroom suite! Floor to Bottom of Side Rails: 3"